Bearded Dragon Habitat: What Is the Best Tank Setup? You may have heard that bearded dragons feel most comfortable in desert vivarium setups and that like to go on walks outside. Also, although they are solitary animals, many videos show several beardies happily living together. However, things are not as straightforward as it may seem at first. In order to be safely kept together, multiple beardies need large enclosures. So, with all the different options and dilemmas flying around the web, you may wonder what the truly best setup for bearded dragons is? Let’s try to find out! I’ve summed up the best resources on the topic, so you can give your pet the setup he deserves. 75-120 gallons (280-455L) for adults: the bigger, the better! How Is the Bearded Dragon Natural Habitat? Bearded dragons come from hot, arid areas of Australia, where vegetation is scarce, and the ground is mostly in the form of dry, hardened soil, rock and some loose soil and sand. Diverse vegetation doesn’t really thrive, but there are still plenty of desert bushes and small trees suitable for hiding and climbing. Water is scarcely available, but it is well-utilized when it does accumulate. That is why beardies love to soak. The Bearded Dragon Tank: What Type of Enclosure Should You Use? According to what we can find in bearded dragon natural habitat, we can conclude the best-suited match in captivity is a desert type terrarium. Low humidity. Bearded dragons have evolved to breathe air that is relatively dry. High humidity – above 65% – can cause deadly pulmonary disease in your pets. Beardies like and require a bright light above their tank, which will keep them warm and alert. Also, they require an additional UV light source – UVA and especially UVB light is necessary for proper metabolism and bone development of your pet. Tank size will depend on the age and size of your beardie. If you are getting a juvenile, you will house him in a smaller, simpler setup until he grows up. With adults, you can go with a full, large desert vivarium setup. Adult bearded dragons are of moderate size but are still quite bulky and active. Hence, they need relatively large terrariums. A juvenile enclosure is a tank your beardie will be housed in before he reaches his adult size. For small babies, a 20-gallon tank is enough. You can find more details on each of these components below. As a general rule, keep juvenile enclosures minimalist, as this will prevent crickets and other feeder insects to hide from your pet. You can go wild with decorations later when you set up his adult cage. Did you know that tank itself can be made of different materials and that some are more suited for bearded dragons than others? Let’s find out what types of tanks you can utilize for a bearded dragon enclosure. Glass tanks are a classic. They offer high visibility and are easy to disinfect. They are not as prone to scratching as plastic tanks. However, for adult bearded dragons, you will need quite a large cage, with the ideal volume being 120 gallons ( ~450 liters). With this in mind, let’s shed a light on a couple of issues lurking if you intend to use a glass tank only. First, the larger the glass tank is, the more prone it is to breaking. Secondly, a large tank will cost you significantly more than a smaller one, mostly because it has to be made out of thicker glass. The way to save money on glass tanks is to buy second-hand ones from aquarists. You may be able to find them relatively cheap. Since you won’t be filling it with water, the possible leakage won’t bother you. Just make sure that the tank doesn’t have a hefty crack since this will get worse in time. While I would always pick a glass tank for a juvenile bearded dragon, for a fully-grown adult other options could be more suitable. In the past couple of decades, plastic tanks have evolved a great deal and went from simple plastic crates to professional, advanced enclosures. These pre-made reptile tanks are usually made out of PVC or ABS plastics. Usually, only the front side is made out of clear, see-through plexiglass-type material; other sides are opaque. Some consider this a disadvantage when it comes to viewing, but the chances are that your pet might feel more secure in this type of enclosure. Plastic tanks are also less prone to breaking than glass tanks, and you have the option of drilling in the holes for cables, making the entire setup neater. The issue with plastic tanks is that they are also really expensive – especially the professional one-piece molded terrariums such as Vision cages, with built-in light structures and other convenient tweaks. It is more affordable to try to find a DIY-style plastic tank. Let’s face it – building a big glass tank, or buying a large pre-made plastic enclosure of 100 gallons or more can get expensive. For those of you who dislike plastic, like DIY projects, or simply want to save money, wooden enclosures might be a winning option. One of the smarter hacks out there is to utilize a wooden shelf or a cabinet as a terrarium. You can also build or order a wooden tank made from scratch. Breeders frequently do this to reduce the housing costs for many animals they have to keep separately. By construction, wooden tanks are similar to plastic ones. A plywood enclosure will have all sides made out of wood except for the front, which is usually a two-piece sliding glass door system. One big drawback of using wood for your tank is that the material is porous – it absorbs water which makes it prone to rotting and mould. You may think this is not an issue because desert terrariums are generally dry. But think again – you will have to give your dragon sprays, and he will splash around in his water bowl. The wood will soak all of that in, along with impurities that will make it smelly and difficult to disinfect. The way to combat this issue is to apply a non-toxic, waterproof coating such as pond shield over the entire wooden surface. It will make smooth and waterproof, and also give it a nice, glossy finish. However, note that quality products of this kind might be hard to find, especially at a low price. Light is a very important feature of almost any reptile tank. Besides giving you a nice view of your pet and his home, proper lighting matters for your beardie’s health too. Being diurnal lizards naturally exposed to the blazing Australian sun, bearded dragons need their entire enclosure to be lit up so they can feel at home. The second important point is the UVA and UVB light, which are necessary for your pet to synthesize vitamin D and for proper function of the overall metabolism, including calcium metabolism and strong bones. An ideal option for young dragons is a combination of regular incandescent bulb housed within a simple, affordable clamp-lamp, and a separate UV fluorescent light in a regular case. You can put both of these your mesh lid. Advantages of this system are its small price – especially when compared to mercury-vapour bulbs – and the fact that you can later use them for your adult enclosure. Linear fluorescent bulbs are the most common type of UVB lighting used in most terrariums. Bearded dragons need the strongest grade – 10.0; the ultraviolet light of your choice needs to offer 5-7% of UVA/B radiation and needs to reach 80% of their habitat. Since juvenile beardies grow fast, they require enough UVB for their bones to grow strong and to avoid any risk of metabolic bone disease. It is best to have a full-spectrum UVA/UVB lamp, but be aware that UVB is the more important type of the ultraviolet spectrum, and therefore a must. UV lights will lose their power in time and have to be replaced about every six months. If you want to be on the safe side, you can get a UV meter to measure the precise radiation of your lamp. For an adult bearded dragon tank, you can use mercury vapor bulbs which provide full-daylight spectrum plus heat, all in one. The warming potential is why you will have to use special ceramic cases for these bulbs. Usually, they look elegant and have an adjustable height. Note that all of this increases the price of mercury vapour setup, although some find it more convenient and nicer looking than two light component setups I described priorly. I have to point out that proper terrarium lighting and the science behind UV lights is a broad topic. Feel free to check out our vivarium lighting article, and consult other resources as well. As you have learned before, beardies are desert dwellers. That means that they prefer high temperatures, but not only that. It also means that they need a temperature gradient – a really warm spot under the basking lamp, and a cooler opposite side of the terrarium. Besides lights, having an elongated tank instead of a square one will help you in providing the gradient. The temperature at the basking spot should reach 110°F (43°C). The average temperature should never fall below 70°F (20°C) – not even at night. Some sources say 65°F (18°C), but I would rather stay on the safe side. In most homes temperature doesn’t fall below this line anyway. However, in case the temperature gets lower than 70°F in your “dragon room”, you should get an undertank heater to keep the temperature in the desired range. Undertank heaters are more suited for this purpose than ceramic bulb heaters because it is a more natural type of heating for nighttime. In nature, rocks that have heated in the sun during the day radiate that heat at night – from below. 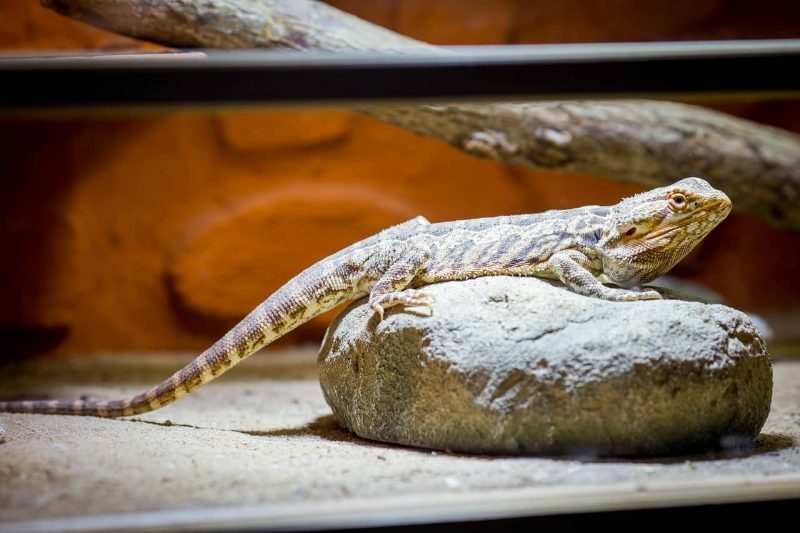 Bedding: What Is the Best Bearded Dragon Substrate? While recommendations on adult dragons and substrates vary, everybody agrees that you should never, ever keep a juvenile bearded dragon on any type of loose substrate. Well, baby beardies eat with great enthusiasm and energy. They will attack their prey with such speed and ferocity that they may end up swallowing the substrate, which can lead to bowel impaction and all kinds of nasty and dangerous health complications. The other issue is that bearded dragons defecate a lot, which makes maintaining the hygiene of the tank with substrate difficult. Let’s have a quick overview of types of substrate you can use for your beardies. Newspaper is probably the cheapest and most easily available disposable ground cover for your beardie’s tank. Most newspapers soak in liquids with ease, which is good to avoid spreading the mess around the tank. The paper is also quite sturdy, so it won’t slip under your pet’s feet when he gets active. Freshly printed newspapers should always be left out in the room for several weeks before putting them in an enclosure. That way you will be sure that the printing paint has dried and won’t leach. Paper towels are another disposable substrate favorite. They look neater and cleaner than newspapers do, and it is very easy to replace them. Paper towels have superior absorbing powers. They are most commonly used in juvenile tanks. Sand is the most debated substrate when it comes to desert vivarium containing lizards. On the plus side, sand is highly decorative and is considered the most natural choice for desert vivariums. However, a great downside is that sand can and will cause impaction if your lizard accidentally eats it. It is also harder to keep clean and can cause unwanted microbe buildup, which increases the risk for diseases. If you still decide to use sand in your cage despite all the risks, you will have to take out the soiled parts every day, and also have to change it completely about once per month. When feeding your beardie, offer food on a smooth surface such as a plate or a smooth plastic lid to decrease the risk from accidental swallowing of the substrate. Sand is never recommended for young dragons, as they are voracious eaters and will most likely end up with quite a lot of sand in their guts, which can effectively kill them. Unlike the young ones, older dragons tend to pick food with their tongues rather than just ram their entire jaws into it. Although coconut coir has great anti-microbial properties, it is not recommended for bearded dragons. Besides being a loose substrate which carries a risk for impaction, coco coir tends to retain moisture, which is not suitable for a desert vivarium. Remember, too much moisture can lead to respiratory infections. The answer to the wood shavings dilemma is quite simple: you should never use wood shavings in your terrarium. Besides being unnatural for bearded dragons and other lizards, it can contain chemicals and also lead to impaction when undigested. So there goes a big No for wood shavings in any beardie tank. Vinyl tiles have become a popular option for terrariums. They are cheap, come in a variety of colors, and are easy to cut. They are also non-porous, which means that you can swipe water and poop right off the surface with ease. However, vinyl is not perfect. It is smoother than, for example, stone slate, and provide less grip for your lizard. Also, as adverse health effects of plastic become more studied, potential issues with PVC are starting to surface. Since the floor of your terrarium will be heated, there is a possibility that plastic can leach hazardous compounds. No research has been conducted to either deny or confirm this in a terrarium setting, but because of what we know when it comes to human housing – I would rather err on the side of caution. When thinking about ceramic tiles, the smooth ones from your bathroom will instantly come to mind. However, there are plenty of patterns and textures available on the market, including those that mimic stone and sand. Ceramic tiles have plenty of other advantages as well. They are inexpensive, relatively easy to cut. Beardies also tend to love the fact that the tiles will get heated. At the same time, this is the only feature you have to be really careful about – you don’t want to use ceramic tiles or stone slates underneath the basking spot if your lamp produces a lot of heat. Slate is the most decorative and natural looking floor cover on the list. Besides that, it has other superior qualities. It provides a good grip for lizard’s movement and helps him wear down his nails. It warms up nicely and then radiates the heat, which bearded dragons love. However, slate also has a couple of faults. It is harder to cut than other alternatives such as vinyl or ceramic tiles. The other issue is that slate is somewhat porous, which means that it will absorb faeces and other impurities more than vinyl or ceramic tiles. For you, that means more diligent cleaning and more bleaching in order to prevent it from smelling and harbouring bacteria. While reptile carpets are often used for beardie enclosures, note that they don’t last too long. Since beardies defecate a lot, and all over the place, they get soiled quickly. If you are still getting a reptile carpet, make sure to get one that is bearded dragon-friendly – with no fiber loops sticking out. Bearded dragons can get their long claws and fingers stuck in there and get hurt. There will always be people in the hobby who are willing to accept the risks that come with loose substrates. Some enthusiasts are passionate about creating an exact copy of the species’ natural habitat. Others want to encourage natural behavior and hate to see their pets frustrated when they lack a place for digging and burrowing. If you are one of these people, you may want to consider using a desert-type bioactive substrate in your beardie vivarium. A bioactive substrate should be able to hold moisture and air, thereby providing a habitat for beneficial microflora and fauna – bacteria and tiny invertebrates that promote biological decomposition of the terrarium waste. That is exactly what makes it bioactive. A bioactive substrate is also able to support plant growth. If the layer is thick enough, it will hold shape – which means that your pet will be able to create burrows, and not just dig with no results. However, the risk of compaction is still present with bioactive substrates. It is best for every owner to make an individual assessment according to the beardie’s character, health status, and eating habits. Another issue with this type of substrate is moisture – since bioactive substrate needs to be moist in order to preserve its functions, you will need to monitor the terrarium humidity more carefully to ensure it won’t exceed desirable levels. In all vivariums, decorative elements are not there just for the looks – they provide important functions, so your pets can bask, rest and hide according to their natural needs and instincts. Bearded dragons love to bask, as almost all diurnal lizards do. Provide them with a basking area – such as a flat rock setup, or a log right under the spotlight. However, be very careful that the basking spot doesn’t overheat, especially if it’s a stone surface that can store a lot of heat. You can prevent this by picking the right strength of light and by assessing the right distance from the basking site. Another favorite activity of all bearded dragons is climbing. The climbing behavior is also observed in their natural habitats. When perched up on some high spot, they can bask in the sun, watch out for predators and track down prey – all at the same time! That is why your pet beardie will gladly hang out above ground in the terrarium setting too. Sturdy, clean branches are always a good choice for bearded dragons. Another convenience that the pet market has to offer are specially designed hammocks. They can also be homemade. Most beardies find these extremely comfy and love to hang around in them once they get used to it. Some resources express their concern about using caves and other types of cover for bearded dragons. Since they need high amounts of UV light to stay healthy, the worry is somewhat justified. However, hiding behaviors are natural for all animals, and especially the ones that are predated upon. A lizard that doesn’t have a place for hiding will always be one stressed lizard. To point it out one more time: healthy, active dragons love to bask. If your beardie spends too much time hiding, rather than removing his hiding place, you should try to track the reasons for his behavior. Is he eating regularly? Are there any signs of illness? Is he under stress because you’ve changed his surroundings, or perhaps you have been handling him too much? If you’ve tracked down the reasons for excessive hiding, but believe that the behavior is preventing your beardie from recovering – you can make a smaller, shallower cave out of paving tiles that will cover about half of his body. The other half of his back and tail will stay exposed to UVB light, so he will make some use out of it. Should I Take My Bearded Dragon For a Walk? Despite everything you can see on the web and on YouTube, beardies do not long for a walk in the park or a drive to an exotic location. We will explore this topic in-depth in our upcoming article on health and behavior. But what you need to know for now is that all that bearded dragons require is access to sunlight in a secured, predator-free, pesticide-free area – to roam around, bask in the sun, and perhaps snack on some dandelions. Ideally, it should be your own, or a friend’s backyard – an environment you are in full control of. Never take out a beardie that is not mature enough, and that isn’t used to being handled. You should start slow and take your bearded dragon out to a chosen location only for a few minutes at the time. Take the beardy outside only when the weather is suitable – as warm as the middle temperature in their terrarium. Never take them out when the humidity is over 65%, and when the temperature in the shade is below the lowest one you have in the tank. Always wait for the sunshine to go outside. Don’t make these excursions every single day. After a while, you will be able to start assessing your beardie’s temperament. Some individuals are by nature shyer than others. Look for signs of stress – such as avoiding food and water and excessive hiding – after every “picnic”. To make your beardie feel more comfortable, he should have a cover – a bench, or similar “roofed” structure he can run under when he gets scared. Using a harness is advisable. You can buy a bearded dragon harness, or make one yourself with relative ease. Never mix your beardie with other pets, even if you believe they do not pose a threat to him. Should I Have a Feeding Tank for My Bearded Dragon? Because beardies tend to get messy, and also to avoid issues with sand impaction, the recommendation to feed them in a specially-designated feeding tank used to be common. However, this feeding principle should be avoided, mostly because of stress your beardie might endure because of it. Juvenile bearded dragons are especially prone to get stressed. You probably already know that a newly acquired beardie needs a substantial amount of time to get used to his new enclosure once you first put him in there. They often refuse to eat or leave their shelter for days. With moving your pet to another cage for feeding, the stress of changing environment practically repeats itself over and over again. Juvenile bearded dragons are more cautious and edgy than adults because in nature they are an easy prey to bigger predators. Although adult beardies are not as skittish as juveniles, they still prefer to have meals in the place they are comfortable in. The bottom line is that it is better to ensure that your main enclosure is safe for feeding – with no sand, or small crevices the feeder insects can crawl into. Can Bearded Dragons Live Together or With Other Species? The first is having an enclosure that is spacious enough, and with a sufficient number of basking and hiding structures to accommodate the needs of all pets. I would not recommend having more than two animals per tank, or three if your enclosure is really spacious – about double the size of the best option for a single beardie (which means more than 200 gallons / 700 liters). Having a spare tank to separate your pets in case something goes wrong is a must. Know that bearded dragons will opportunistically feed in on smaller lizards. Roommate beardies must be of the same size to avoid triggering the predatory drive. Never house two males together, as they will fight for territory. Two females are the most stress-free option for keeping a couple of beardies. Some hobbyists are brave enough to try to keep different species lizards together. It is important that they are of the same size, and that they come from same or very similar habitats. Species that my colleague Ben recommends as potential beardie roommates include desert tortoises, shingleback lizards, blue tongue skinks, and nocturnal desert geckos. As you can see, there is no exact formula for a perfect bearded dragon setup. There are plenty of options when it comes to the type of tank, substrate, and decorations, and a couple of options for lighting. You can combine what suits your taste and needs as long as you watch out for basic needs and safety of your beardie. An environment that is dry, warm, well-lit with both visible and UVA/UVB parts of the spectrum, safe and comfortable will give your beardie just what he needs to thrive. What is your ideal bearded dragon enclosure? What’s your experience with different types of tanks and substrates? Does your beardie like to be taken out? We would love to hear from you, so feel free to post your story in the comments below! ABS – very durable type of very solid, glossy thermoplastic material. Diurnal – an animal active during the day. PVC – Polyvinyl chloride, a type of thermoplastic used very widely across many industries. UVA – The part of the ultraviolet spectrum that supports your beardie’s overall health, activity and appetite. UVB – The part of the ultraviolet light that is responsible for vitamin D3 synthesis, which is essential for calcium metabolism. Bearded Dragon Brumation: What are the Signs? This was the most helpful information that we have found on bearded dragon and appreciate it so much! Thank you for taking the time to write it! This article was very helpful – thank you! We just got our dragon a month ago, and your articles are helping us to learn how to take good care of her. Your articles are very informative. Thank you!